SHAWNEE – Legendary Oklahoma Baptist University swimming and diving coach Sam Freas, who led OBU to seven national championships after starting the university’s swimming and diving programs in 2011, passed away Sunday night, March 24, at the age of 72. Freas’ celebrated career, which included coaching South Africa’s Olympic swim team, spanned several decades with successful stints at Arkansas, Hawaii, LSU, Allegheny and SUNY-Potsdam before coming to Bison Hill to establish OBU’s men’s and women’s swimming and diving programs. Freas laid the foundation for what quickly became one of the school’s most successful programs. In his first four seasons, his men’s teams at OBU won the NAIA national championship every year. After a runner-up finish in 2012, the women’s team won the national championship three consecutive years. As OBU made the transition to NCAA Division II membership, Freas’ teams established themselves as national contenders, with both the Bison and Lady Bison finishing fifth in their first appearance at the 2018 NCAA Championships and taking home individual national titles in the men’s 50 free, men’s 200 free relay, and women’s three-meter diving. At the recently completed 2019 Division II Championships in Indianapolis, OBU’s women’s team posted a second consecutive top-10 finish, while the men were again among the nation’s top 20 programs. He was 64-12 at Allegheny, 84-15 at Arkansas, 61-9 at LSU and 40-0 at Hawaii in dual meets, with multiple top-10 team finishes at each stop. His swimmers at Arkansas set seven U.S. records, three world records and produced 11 Olympians and one world champion. In all, 19 of his college swimmers have competed in the Olympics. In addition to his work in coaching, Freas was a well-respected professor in OBU’s physical education and health and human performance departments, and also served as a faculty member at Arkansas, LSU and Allegheny College. He also was director of athletics and health, physical education and recreation at Kenyon College in Gambier, Ohio, and associate dean at Palm Beach State College in West Palm Beach, Fla.
Freas attended the United States Military Academy at West Point and graduated from Springfield College with bachelor’s and master’s degrees. He did doctoral studies at the University of Iowa before earning a doctor of education degree from California Western. Freas was Southwest Conference Coach of the Year four times, Southeastern Conference Coach of the Year three times and Western Athletic Conference Coach of the Year twice in swimming and once in diving. 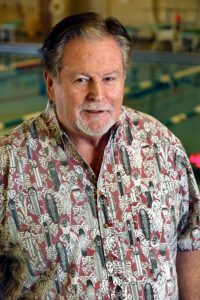 An influential author of several books on swimming, Freas served as president and CEO of the International Swimming Hall of Fame from 1989-2004. Freas is survived by his wife of 43 years, Rosemary, and their four children and 11 grandchildren. View more articles by Justin Tinder.